Alicia Keys is an American singer and songwriter. She gained fame after releasing her debut album “Songs in A Minor” in 2001, for which she earned five Grammy Awards. She is best known for her singles “Fallin'”, “You Don’t Know My Name”, “If I Ain’t Got You” and “Diary”. She is one of the most successful and marketable artists of the current time who has sold over 35 million albums and 30 million singles worldwide. Keys has received numerous awards throughout her career, including 15 Grammy Awards, 17 NAACP Image Awards, and 12 ASCAP Awards, as of 2018. Alicia Keys was born on 25 January 1981, in Hell’s Kitchen, Manhattan, New York, U.S. Her ancestry is African American, Sicilian, Scottish, Irish. 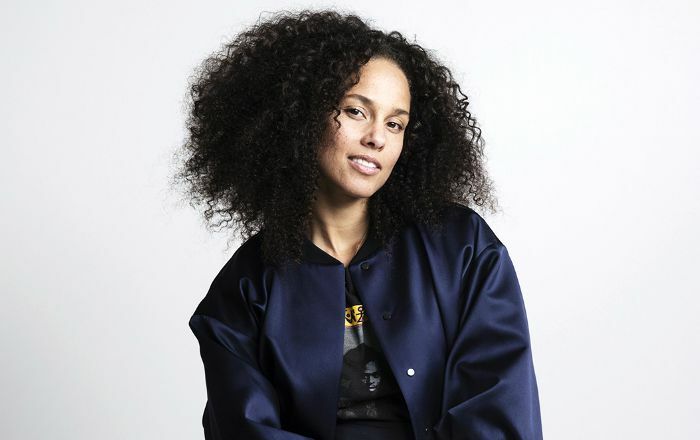 Alicia Keys joined the Professional Performing Arts School at the age of 12 and graduated in four years as valedictorian at the age of 16, majoring in a choir. She later got enrolled at the Columbia University but left her studied to make a career in music. Alicia Keys is married to producer Swizz Beatz in July 2010 after dating for two years. The couple welcomed their first son, Egypt Daoud Dean, in October 2010. She gave birth to their second son, Genesis Ali Dean, in December 2014. Alicia Keys dropped her debut album Songs in A Minor on June 5, 2001. The album topped the music charts in the US, US R&B, and the Netherlands and was certified as 6x Platinum in the USA. It spawned hit singles “Fallin”, “A Woman’s Worth” and “How Come You Don’t Call Me” and sold 12 million copies of the album worldwide. She won five Grammy Awards in various categories for the single “Fallin”, making her the second female solo artist to win five Grammy Awards in a single night. Alicia Keys was first cast as Georgia Sykes in Joe Carnahan’s Smokin’ Aces in 2007. Alicia made her first appearance in any television series as Maria in NBC’s sitcom The Cosby Show in an episode titled “Slumber Party”. Keys has done endorsement work for several brands including BlackBerry, Citibank Private Pass Credit Card and Proactiv acne treatment. Alicia Keys has a total net worth of $80 million dollars. She resides in a luxury mansion in Englewood, New Jersey, USA.She owns a pink Lotus Evora GTE. Alicia started playing piano at the age of seven. she began songwriting at age fourteen. She cites Donny Hathaway, Marvin Gaye, Nina Simone, Stevie Wonder, Tupac Shakur, The Notorious B.I.G., Jay-Z and the Wu-Tang Clan as her musical influences. Alicia was named one of People Magazine’s “Breakthrough Stars of 2001”. Alicia was named one of the 50 Most Beautiful People by People Magazine in 2002. She ranked #77 on the Maxim magazine Hot 100 of 2008 list. In 2010, Alicia wrote the song ‘Speechless’, which she dedicated to the birth of her first son, Egypt. In 2011, a wax figure of Keys was unveiled at Madame Tussauds New York. In May 2017, she merited a place in TIME magazine’s “The 100 Most Influential People” issue with an homage written by Kerry Washington. In May 2017, Alicia Keys received and shared the award for the Ambassador of Conscience 2017 from Amnesty International alongside Canadian Indigenous rights activists. Alicia has won a number of awards including 15 Grammy Awards, 17 NAACP Image Awards, 9 Billboard Music Awards and 7 BET Awards.